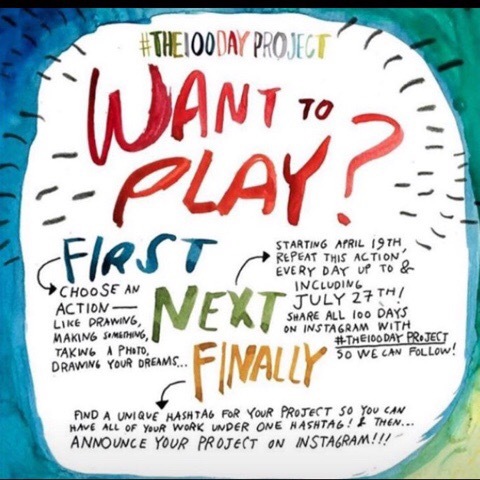 Yesterday morning a post appeared on a FB group that I’m part of discussing #the100daysproject. My “crochet by FB” buddy Jo tagged me in a comment about doing a granny square a day. Well that’s not a challenge. I can do that. That is until you see my to do list for crochet projects and then you see that maybe it’s not so easy but that’s another thing to come back to another day! Anyway, so on my way to Lemon and Ginger this conversation is going backwards and forwards and we formulate a plan. Hannah and Jo’s 100 Day Challenge is to crochet an Elmer blanket (a bit like this one by Lucy at Attic24) but not just one pattern of crocheted granny squares we are using the book 200 Crochet Blocks for Blankets, Throws and Afghans as we both have our own copies. Oh and the sneaky thing is that technically there is 108 squares in the Elmer blanket that we’re following. So here we go, Day One…let’s do this thing! Are you joining in? Have you come up with a plan? This entry was posted in 100Daysproject, Knitting, Crochet and Arty Bits.